Just to review what the Moon means to each of us, it is our emotional seat. Our security, whatever that might mean is reflected in our Moon. It also represents the idea of the hour, no doubt due to the fact that the Moon moves very quickly through a sign. It can take the Moon 2.5 days in each sign! The Moon goes through each sign each month. This is why Astrologers work with Lunar Returns, because the Moon returns to the place of each of our births every month. This kind of chart can be a great source to look at for predictive work. In our Natal charts the Moon is sometimes harder to figure out, if you were to try and guess. It is not always a part of a person that is on the surface for the world to see. Although there are those Moon signs and people with them that are more open because their personalities are geared that way. So on some it is right out there and easy to guess at, but others keep things like how they feel, to themselves. Mother is what the Moon represents in the chart, it is the person who nurtured us (or lack thereof) as we grew. The relationship we have with our Mothers is reflected in the energy of the Moon. It is not unusual for there to be several siblings in a family with the same Moon. Though it could be that all the siblings have different Moons, because they each saw their Mother in a different way. Each having their own relationship with her. So all the above is more or less review on our relationship with the Moon. The Moon as it travels through each sign also affecting us as it relates to the other planets, TNPs and Asteroids on the chart as well as the planets, TNPs and Asteroids that are transitioning at the time. So we are continually affected by the Moon and the placement of the Moon. Looking at the Moon in Gemini a sign that is noted more for it’s intellectual prowess. In Gemini we are likely to “think too much.” This can be good but it can also be bad. Some things in life are meant to be felt not intellectualized. With the Moon in Gemini there could also be a need for more information, a need to talk more. 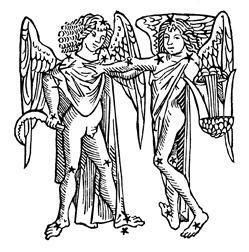 People can be very chatty with the Moon in Gemini, they can also be very charming. But this is also a sign where some people will tend toward embellishment of the truth. Certainly those with Moon in Gemini are not liars but surely they are very clever about covering up the truth when they need to. This sign was after all has it’s thievery qualities as well. Really clever people can really take advantage of those who are not as quick. To the person who has a Moon in Gemini, it is tough for you to make decisions, particularly emotional ones. There is a tendency to be very fickle and indecisive. A tendency to change one’s mind mid-stream is also normal behavior. With that said, these tendencies could also show up as highlights during the Moon’s run through Gemini. Could be you will find that you are meeting more Gemini people when the Moon is in Gemini. Life could feel a bit busier, situations could require more communication skills or travel. Movement in general is a concept of the energy of Gemini and surely during the few days of the month the Moon sits here we can take advantage by catching up on communications. Check your social networks and catch up on gossip or take a trip, use your Gemini energy to the fullest.